Right by shinsaibashi station and all the luxury shopping. Less than 10 min walk to dotonburi. Lots of restaurants and shopping around the location. There’s a sake bar downstairs if you like drinking. No secured luggage storage, but they do have a lock box for your things next to each bed. The receptionists are all sweet. When I got sick, one of the receptionists helped me pick which medicine to get at the drug store so I can relieve my symptoms. I really love that there is a big lockbox for each guest to put away our belongings safely. The hostel is within a walking distance of Dotonbori which is absolutely perfect. When I decide to visit Osaka again, I will definitely be staying at Osaka Hana Hostel again for sure. Maybe not the most social hostel but very convenient and comfortable. Staff is so friendly and they speak English well. The location is perfect, so many restaurants and bars around. Close to Dotonbori where you'll probably go a lot. I had a very nice stay at Osaka Hana Hostel. The staff are incredibly friendly and very knowledgeable about the city. They were able to recommend most restaurants and landmarks that I visited. The kitchen area is very open and a good spot to enjoy a cup of tea. The showers were clean and had hot water. The beds were comfortable and there is a locker located next to it for important items. 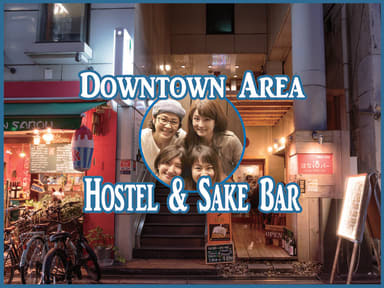 The location is fantastic as the hostel is located right in downtown Osaka. I would totally stay here again. 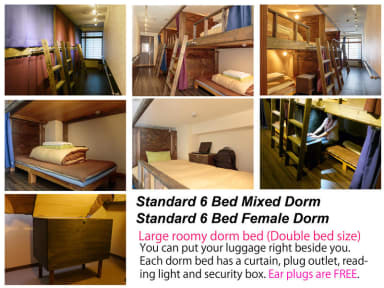 Lovely little hostel that provide all the basic facilities for a comfortable stay and is well locate near a metro station and is walking distance to many of Osaka popular activities area such as Dotonbori , Amerikamura. Perfect location, the hostel isn't very social vibe. Clean rooms and small showers in each dorm, very nice. I had a very enjoyable stay at Osaka Hana Hostel. The staff are friendly, helpful and welcoming and the facilities are very clean. The sake bar downstairs is great, and the full kitchen set up if fantastic. I think the atmosphere was much quieter as I was visiting in February so there was not many opportunity to meet fellow travellers. I would definitely stay here again. Very well located and clean. While the common areas are nice, there is not a lot of socialising going on as the rooms are spread out over 8 floors.